Mono 2000 is for post classic cars. Typically F4 or Dallara pre 1996 F3. 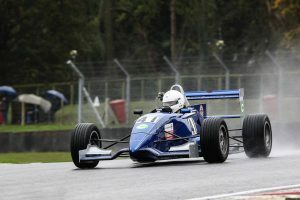 Chassis must have been first produced for 2001 model year or earlier, 1999 for Formula Renault or 1996 for carbon F3. Standard production engines up to 2000cc capacity. Dry sump lubrication permitted. Flywheel free. Carburettors or throttle body fuel injection. Ford Zetec engines can have free cam timing (retaining standard camshaft and pulley). Engines of manufacture and model as used in FIA international Formula 3 during 1996 or earlier, having a 25 millimetre maximum diameter air restrictor through which all air serving the induction is passed.